Magnesium oxide is produced by the calcination of magnesium carbonate or magnesium hydroxide. The latter is obtained by the treatment of magnesium chloride solutions, typically seawater, with lime. Calcining at different temperatures produces magnesium oxide of different reactivity. High temperatures 1500 – 2000 °C diminish the available surface area and produces dead-burned (often called dead burnt) magnesia, an unreactive form used as a refractory. Calcining temperatures 1000 – 1500 °C produce hard-burned magnesia, which has limited reactivity and calcining at lower temperature, (700–1000 °C) produces light-burned magnesia, a reactive form, also known as caustic calcined magnesia. Although some decomposition of the carbonate to oxide occurs at temperatures below 700 °C, the resulting materials appears to reabsorb carbon dioxide from the air. MgO is prized as a refractory material, i.e. a solid that is physically and chemically stable at high temperatures. It has two useful attributes: high thermal conductivity and low electrical conductivity. "By far the largest consumer of magnesia worldwide is the refractory industry, which consumed about 56 % of the magnesia in the United States in 2004, the remaining 44 % being used in agricultural, chemical, construction, environmental, and other industrial applications." MgO is used as a basic refractory material for crucibles. It is a principal fireproofing ingredient in construction materials. As a construction material, magnesium oxide wallboards have several attractive characteristics: fire resistance, termite resistance, moisture resistance, mold and mildew resistance, and strength. MgO is one of the components in Portland cement in dry process plants. Many heavy metals species, such as lead and cadmium are most soluble in water at acidic pH (below 6) as well as high pH (above 11). Solubility of metals affects bioavailability of the species and mobility soil and groundwater systems. Most metal species are toxic to humans at certain concentrations, therefore it is imperative to minimize metal bioavailability and mobility. Granular MgO is often blended into metals-contaminated soil or waste material, which is also commonly of a low (acidic) pH, in order to drive the pH into the 8–10 range where most metals are at their lowest solubilities. Metal-hydroxide complexes have a tendency to precipitate out of aqueous solution in the pH range of 8–10. MgO is widely regarded as the most effective metals stabilization compound when compared to Portland cement, lime, kiln dust products, power generation waste products, and various proprietary products due to MgO's superior buffering capacity, cost effectiveness, and ease/safety of handling. Most, if not all products that are marketed as metals stabilization technologies create very high pH conditions in aquifers whereas MgO creates an ideal aquifer condition with a pH of 8–10. Additionally, magnesium, an essential element to most biological systems, is provided to soil and groundwater microbial populations during MgO-assisted metals remediation as an added benefit. Magnesium oxide has poor solubility in water and is poorly absorbed from the gut. For this reason, magnesium oxide is relatively ineffective for correcting magnesium deficiency. Magnesium oxide is used for relief of heartburn and sour stomach, as an antacid, magnesium supplement, and as a short-term laxative. It is also used to improve symptoms of indigestion. Side effects of magnesium oxide may include nausea and cramping. In quantities sufficient to obtain a laxative effect, side effects of long-term use include enteroliths resulting in bowel obstruction. As a food additive, it is used as an anti-caking agent. It is known to the FDA for cacao products; canned peas; and frozen dessert. It has an E number of E530. It is used as a reference white color in colorimetry, owing to its good diffusing and reflectivity properties. It may be smoked onto the surface of an opaque material to form an integrating sphere. It is used extensively as an electrical insulator in tubular construction heating elements. There are several mesh sizes available and most commonly used ones are 40 and 80 mesh per the American Foundry Society. The extensive use is due to its high dielectric strength and average thermal conductivity. MgO is usually crushed and compacted with minimal airgaps or voids. The electrical heating industry also experimented with aluminium oxide, but it is not used anymore. It is also used as an insulator in heat-resistant electrical cable. MgO doping has been shown to effectively inhibit grain growth in ceramics and improve their fracture toughness by transforming the mechanism of crack growth at nanoscale. Pressed MgO is used as an optical material. It is transparent from 0.3 to 7 µm. The refractive index is 1.72 at 1 µm and the Abbe number is 53.58. It is sometimes known by the Eastman Kodak trademarked name Irtran-5, although this designation is obsolete. Crystalline pure MgO is available commercially and has a small use in infrared optics. MgO is packed around transuranic waste at the Waste Isolation Pilot Plant, to control the solubility of radionuclides. MgO has an important place as a commercial plant fertilizer  and as animal feed. An aerosolized solution of MgO is used in library science and collections management for the deacidification of at-risk paper items. In this process, the alkalinity of MgO (and similar compounds) neutralizes the relatively high acidity characteristic of low-quality paper, thus slowing the rate of deterioration. MgO is also used as a protective coating in plasma displays. 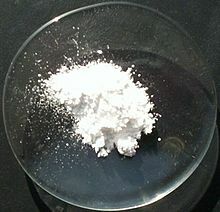 Magnesium oxide is used as an oxide barrier in spin-tunneling devices. Owing to the crystalline structure of its thin films, which can be deposited by magnetron sputtering, for example, it shows characteristics superior to those of the commonly used amorphous Al2O3. In particular, spin polarization of about 85% has been achieved with MgO versus 40–60 % with aluminium oxide. The value of tunnel magnetoresistance is also significantly higher for MgO (600% at room temperature and 1,100 % at 4.2 K) than Al2O3 (ca. 70% at room temperature). MgO is thermally stable up to about 700 K, vs. 600 K for Al2O3. Inhalation of magnesium oxide fumes can cause metal fume fever. ^ a b c d Haynes, William M., ed. (2011). CRC Handbook of Chemistry and Physics (92nd ed.). Boca Raton, FL: CRC Press. p. 4.74. ISBN 1439855110. ^ Taurian, O.E. ; Springborg, M.; Christensen, N.E. (1985). "Self-consistent electronic structures of MgO and SrO" (PDF). Solid State Communications. 55 (4): 351–5. Bibcode:1985SSCom..55..351T. doi:10.1016/0038-1098(85)90622-2. ^ a b Haynes, William M., ed. (2011). CRC Handbook of Chemistry and Physics (92nd ed.). Boca Raton, FL: CRC Press. p. 5.15. ISBN 1439855110. ^ a b Haynes, William M., ed. (2011). CRC Handbook of Chemistry and Physics (92nd ed.). Boca Raton, FL: CRC Press. p. 5.2. ISBN 1439855110. ^ a b c NIOSH Pocket Guide to Chemical Hazards. "#0374". National Institute for Occupational Safety and Health (NIOSH). ^ Zhu, Qiang; Oganov A.R. ; Lyakhov A.O. (2013). "Novel stable compounds in the Mg-O system under high pressure" (PDF). Phys. Chem. Chem. Phys. 15 (20): 7696–7700. Bibcode:2013PCCP...15.7696Z. doi:10.1039/c3cp50678a. ^ Mei, AB; O. Hellman; C. M. Schlepütz; A. Rockett; T.-C. Chiang; L. Hultman; I. Petrov; J. E. Greene (2015). "Reflection Thermal Diffuse X-Ray Scattering for Quantitative Determination of Phonon Dispersion Relations". Physical Review B. 92 (17): 174301. Bibcode:2015PhRvB..92q4301M. doi:10.1103/physrevb.92.174301. 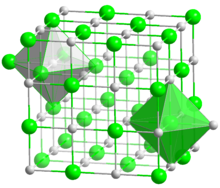 ^ Ropp, R C. Encyclopedia of the alkaline earth compounds. Elsevier. p. 109. ISBN 9780444595508. ^ Mark A. Shand (2006). The chemistry and technology of magnesia. John Wiley and Sons. ISBN 978-0-471-65603-6. Retrieved 10 September 2011. ^ Tatekawa Y, Nakatani K, Ishii H, et al. (1996). "Small bowel obstruction caused by a medication bezoar: report of a case". Surgery today. 26 (1): 68–70. doi:10.1007/BF00311997. PMID 8680127. ^ "Compound Summary for CID 14792 - Magnesium Oxide". PubChem. ^ Tellex, Peter A.; Waldron, Jack R. (1955). "Reflectance of Magnesium Oxide". JOSA. 45 (1): 19. doi:10.1364/JOSA.45.000019. ^ Tan, C.Y. ; Yaghoubi, A.; Ramesh, S.; Adzila, S.; Purbolaksono, J.; Hassan, M.A. ; Kutty, M.G. (December 2013). "Sintering and mechanical properties of MgO-doped nanocrystalline hydroxyapatite" (PDF). Ceramics International. 39 (8): 8979–8983. doi:10.1016/j.ceramint.2013.04.098. ^ Stephens, Robert E. & Malitson, Irving H. (1952). "Index of Refraction of Magnesium Oxide" (PDF). Journal of Research of the National Bureau of Standards. 49 (4): 249–252. doi:10.6028/jres.049.025. ^ Nutrient Science. fertilizer101.org. Retrieved on 2017-04-26. ^ "Mass Deacidification: Saving the Written Word". Library of Congress. Retrieved 26 September 2011. ^ Parkin, S. S. P.; Kaiser, C.; Panchula, A.; Rice, P. M.; Hughes, B.; Samant, M.; Yang, S. H. (2004). "Giant tunnelling magnetoresistance at room temperature with MgO (100) tunnel barriers". Nature Materials. 3 (12): 862–867. Bibcode:2004NatMa...3..862P. doi:10.1038/nmat1256. PMID 15516928. ^ Monsma, D. J.; Parkin, S. S. P. (2000). "Spin polarization of tunneling current from ferromagnet/Al2O3 interfaces using copper-doped aluminum superconducting films". Applied Physics Letters. 77 (5): 720. Bibcode:2000ApPhL..77..720M. doi:10.1063/1.127097. ^ Ikeda, S.; Hayakawa, J.; Ashizawa, Y.; Lee, Y. M.; Miura, K.; Hasegawa, H.; Tsunoda, M.; Matsukura, F.; Ohno, H. (2008). "Tunnel magnetoresistance of 604% at 300 K by suppression of Ta diffusion in CoFeB∕MgO∕CoFeB pseudo-spin-valves annealed at high temperature". Applied Physics Letters. 93 (8): 082508. Bibcode:2008ApPhL..93h2508I. doi:10.1063/1.2976435. ^ Wang, D.; Nordman, C.; Daughton, J. M.; Qian, Z.; Fink, J.; Wang, D.; Nordman, C.; Daughton, J. M.; Qian, Z.; Fink, J. (2004). "70% TMR at Room Temperature for SDT Sandwich Junctions with CoFeB as Free and Reference Layers". IEEE Transactions on Magnetics. 40 (4): 2269. Bibcode:2004ITM....40.2269W. CiteSeerX 10.1.1.476.8544. doi:10.1109/TMAG.2004.830219. ^ Magnesium Oxide. National Pollutant Inventory, Government of Australia.